The new partnership will allow both organizations to better reach out to inner-city adolescents in Atlanta with a message of leadership and teamwork. Bright Futures Atlanta is proud to announce a new partnership with G.A.M.E., an organization founded by Georgia Tech baseball coach Danny Hall. Bright Futures Atlanta is committed to providing at-risk youth in the inner-city Atlanta area with educational opportunities, after-school programming, summer camp and other activities to help them develop into positive and productive adults. G.A.M.E. is a non-profit organization whose mission is to provide an environment where at-risk youth can interact with mentors, learn life skills and play baseball. The organization has four base principles that make up its name: Guidance, Athletics, Mentorship and Education. "Our partnership with G.A.M.E. will be of great value to the young people in the Bright Futures Atlanta program," said Philip Ross, Executive Director of Bright Futures Atlanta. "The skills that children and teenagers can gain through sports like baseball have a tremendous impact on their development into confident and responsible adults. We're excited to see the result of this partnership." Under the partnership, Bright Futures Atlanta and G.A.M.E. will work together with the adolescents involved in the Bright Futures Atlanta program, as well as other young people in Atlanta moving forward. 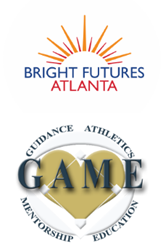 "Through this partnership with Bright Futures Atlanta, we'll be able to better reach out to children and teens in our local community with our message of sportsmanship, teamwork and integrity," said Mike Nickeas, G.A.M.E. Executive Director. "We're looking forward to seeing firsthand the difference that hope and mentorship can make in these young peoples' lives." A launch party for the partnership was held on Saturday, February 6 at The Callaway Club at McCamish Pavilion, Georgia Tech’s indoor arena. Nickeas and Coach Hall were joined by a panel of MLB guests at the exclusive event, which also included food, drinks and networking. To learn more about Bright Futures Atlanta, visit BFATL.org. To learn more about G.A.M.E., visit ATLGame.org. Bright Futures Atlanta is a Christian-based, year-round program offering academic instruction and after-school programming, as well as camp during the summer, to at-risk youth in inner city Atlanta. The organization was founded in 2002, and in 2009, Bright Futures Academy was established. The 10,000+ square foot education center is currently located at 1300 Joseph E. Boone Boulevard NW. To learn more about Bright Futures Atlanta, visit BFATL.org.